Our 4 seasons synthetic comforters are ideal to accompany your nights in all seasons. 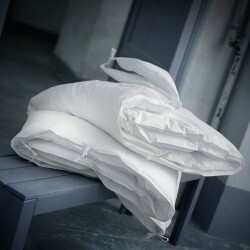 Adaptable, they consist of 2 comforters: a summer comforter and a mid-season comforter, which when interconnected by cotton ties, are transformed into a warm comforter for the winter. A real alternative to down, the microfiber provides an extreme softness touch. Our comforters can be tailor made on request. The deadline for the manufacture is 10 days. All special sizes are not taken back or exchanged. For those who want protection against mites, your 4-season synthetic comforter will receive the exclusive GSD process created by Dumas Paris: a double envelope with an anti-mite and anti bacterial inner lining for maximum anti-allergy protection.